Here’s to starting 2015 off with a bang! I’d never heard of this book or this author, but bought the book on impulse when I was browsing at Barnes & Noble and saw it on the Pages to Movie shelves. I do like a good western. 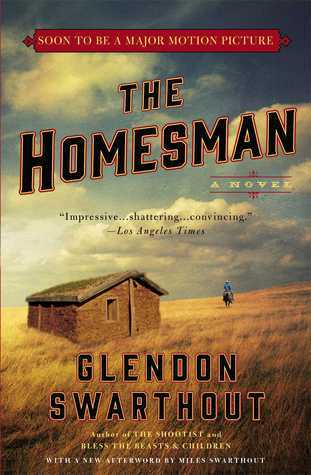 Stories abound about American settlers whose grit and determination saw them through hardship and ultimately helped them succeed and achieve their version of the American dream; The Homesman stands out as the story not of winners, but of those broken and shattered by hardship in the American West. In a lonely stretch of barely settled territory in Nebraska in the 1850s, four women have lost their minds. All wives of men who sought new lives and, hopefully, prosperity by going west, terrible circumstances have driven these poor souls over the edge, and they can no longer care for themselves or their families; nor can their husbands care for them. As there is no asylum in the vicinity, the only thing to do is to send these women back to their kinsfolk back east. Since these women cannot care for themselves, let alone travel by themselves, they must be chaperoned by a local man – or “homesman” – who either volunteers or is chosen by a drawing. When none of the contenders is willing or able to accompany these four women back east, Mary Bee Cuddy volunteers. Mary Bee is a former school teacher, and at the ripe old age of 31, considered a spinster. “Plain as an old tin pail,” Mary Bee nonetheless is strong in body and spirit, fiercely able and independent, and kinder and more compassionate than most. When she steps up to take on the task of traveling with the four incapacitated women, she knows that she really cannot do it alone. By chance, she saves the skin of George Briggs, scoundrel, deserter, claim jumper, and general no-good louse, and cuts a deal with him to help her in exchange for saving his life. So begins their trek across endless prairie, through rain, wind, ice storm, filth, hunger, an encounter with hostile Indians, and all manner of adventure and difficulty. Mary Bee and George Briggs form a reluctant partnership, and I started predicting a feel-good, happily ever after love story emerging. Then, the story took a turn that felt like a swift kick in the gut. That’s all I will say about that – no spoilers. There were aspects of the story I found unlikely – for instance, the fact that all four women who lost their minds seemed to exhibit identical symptoms: loss of the ability to communicate and cognitive impairment to the point of near catatonia. I don’t think that’s what actual “insanity” looks like, and even if it does in some cases, the likelihood of four women from the same locale all developing the same exact form of “insanity” seems very improbable. Nevertheless, I loved this story. It’s wonderfully written, and the characters and scenes are so vivid, reading it felt like watching it. It’s a profound picture, too, of how, historically, women have been so completely at the mercy of men, being required to follow husbands all over Kingdom Come and do their bidding, at terrible, tragic cost.